Rami Malek adds another trophy to his case for his portrayal of Freddie Mercury in the award-winning biopic Bohemian Rhapsody. 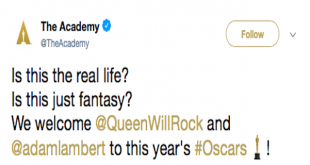 Queen + Adam Lambert opened the 2019 Oscars ceremony with a performance of several hits. Despite mixed reviews, the Queen biopic ‘Bohemian Rhapsody’ killed the competition with an opening weekend of $50M. Future front-woman for Queen shows her carseat karaoke skills on “Bohemian Rhapsody”. The final trailer for the Queen Biopic is out now. New clips from the Queen biopic Bohemian Rhapsody show the band creating their legendary anthem “We Will Rock You”. Panic! At the Disco killed a cover of Queen’s “Bohemian Rhapsody” at the 2018 American Music Awards.